at Papa o Te Aroha Marae, Tokoroa, 2016. 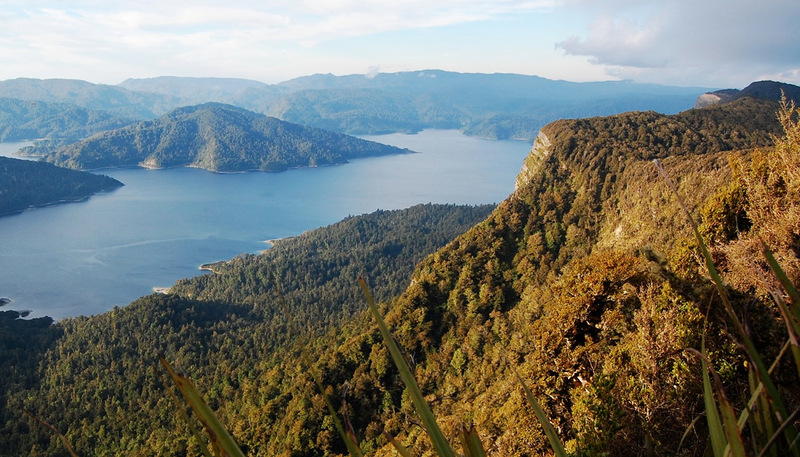 New Zealand has led the world in giving the Te Urewera park lands their own legal identity. New Royal Society of New Zealand Fellow Jacinta Ruru calls in from the 2016 World Indigenous Law Conference in Los Angeles, where she’s at the centre of intense international interest in this revolutionary legal move. 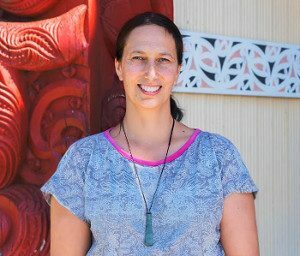 The University of Otago law professor and co-director of Ngā Pae o te Māramatanga New Zealand’s Māori Centre of Research Excellence tells us how Te Urewera has allowed two different cultural ways of seeing the land in law, something that’s been missing in New Zealand for over 150 years. One of the major themes is on the Doctrine of Discovery, a concept of international law that began right back in the 1400s, and really articulates how the Europeans sought to legitimize their taking of Indigenous peoples’ sovereignty and property in the New World. I’m focusing on how the fictions of this law worked in a New Zealand context; how state laws were developed despite the guarantees in the Treaty of Waitangi. Part of the Doctrine of Discovery was that Europeans were only going to recognise indigenous peoples’ property rights if those property rights were recognisable to them. And of course they didn’t understand concepts of indigenous communal land and lots of different families having responsibilities of use. The European idea was that you could put a white picket fence around the land and say this is my land. This attitude is prevalent right across our whole legal system. If you take national parks, the English recognised the absolute beauty and scenic value of those lands high up in the mountain ranges. But they didn’t see them as providing a lot of utilitarian benefit, because they couldn’t be used for farming. So a lot of that early Pakeha law and policy talks about those lands as waste lands. For Māori, those lands were not regarded as waste lands, but rather as integral to tribal identities. So it was significant that in the late 1880s the Tūwharetoa chief gifted the summit of Tongariro to the New Zealand Government for the purposes of creating a national park. This was to be New Zealand’s first national park and only the fourth national park in the world. But it wasn’t established for seven years. Why was there this delay? The answer is the friction that takes place because the Government accepts that gifted summit land but wants the surrounding land too, so as to be able to promote the area as a tourism destination. Māori tribes were saying ‘no, we don’t want to gift all our lands’. But when our first national park law was enacted it permitted Crown confiscation of this surrounding land. It is an horrendous nation-making story. It was said at the time that there may be some compensation, but I don’t think there was any given. I’ve read through the Hansard parliamentary discussions later on and for example in the 1920s there is a great discussion with MPs wanting to encourage more tourists into Tongariro National Park. Some say ‘well, let’s build a Māori village there’, so on one hand they are keen to put Māori back into the landscape. Then another MP asks if that means that Māori are going to be able to take Kereru from national parks. And the answer is no. What does that history mean for our national parks today? Those laws are both historical and relevant in a more contemporary context. There has been a really in-depth Waitangi Tribunal inquiry into Tongariro National Park, which recommended that the New Zealand Government look at co-governance. And the Conservation Act, the main umbrella statute that manages our national parks, says that management must give effect to principles of the Treaty of Waitangi. So the Department of Conservation has been working to create management that is more respectful. An interesting feature of Treaty of Waitangi settlements is that they’ve been spread out over two decades. So the Ngai Tahu settlement in 1998, which were one of the first major negotiations – that was the best settlement that they could get then. It brought Ngai Tahu the right to have one person sit on each conservation board, and on the New Zealand Conservation Authority. It also brought some recognition that some lands are of special significance. Most other settlements so far have been similar. But when you have something like Te Urewera it’s a significant game changer. How did that come about – making Te Urewera National Park into it’s own legal entity? A United States Professor Christopher Stone first wrote a seminal piece about this in the 1970s, Should trees have standing?, arguing that nature ought to be able to be represented in court. When the New Zealand Government was considering how to move forward with treaty negotiations with Tuhoe, the iwi was arguing for ownership of the park. There was writing recently published from myself and a couple of others, looking back at that work by Christopher Stone. Giving the land its own identity completely neutralised that ownership issue. The land is no longer a national park, it is its own legal identity. Giving land a legal personality hasn’t happened anywhere else in the world. Te Urewera has also been revolutionary in allowing recognition of two different ways of seeing the land. And sitting on top of the legal identity is a really exciting management regime that is eventually going to become Tuhoe dominated. At the moment it’s 50/50. There will still be public access, recreation and scenic values must be recognised, but it’s also viewed as an essential part of what it means to be Tuhoe. It’s going to be really exciting to watch in future. Has there been a lot of interest from around the world? It had been very quiet both on a national context and internationally. Then this June it was picked up by the New York Times that New Zealand’s Parliament was considering legal recognition of the Whanganui River as having its own legal personality, and the reporter noted that New Zealand actually already did this two years ago with Te Urewera. That article referenced my Māori Law Review article. Almost immediately I started getting all this intense interest: I’ve been doing interviews for media in Australia, the United States, Canada, India and Japan; the Guardian newspaper made a short video that went viral; and this week I’m here in the United States meeting with two different groups who are interested in the concept. One is a state legislator – like an MP – who has drafted some legislation that he would like to see the Arizona State Legislature enact for some of his tribal lands. There’s also a group in San Francisco that are very interested, and I think there will be several delegations on this to New Zealand from the United States and Canada next year. Do you expect other New Zealand national parks to become their own legal entities? The New Zealand Government has been clear that they don’t see that legal personality concept travelling to other national parks. There are still some national parks that haven’t yet come through treaty settlements. It will be interesting to see what the solution is for Tongariro. It will also be interesting to see what is negotiated for Taranaki, which was our second national park. For other parks, I can’t see how it could change unless the Government was keen to amend the National Parks Act 1980. Looking at that out-of-date piece of legislation would be a great opportunity to really be much more inclusive about why we have national parks. Of course they are scenic, and important for recreation and science and biodiversity, but it’s also because they are symbolic of our national identity. National parks encase land that from a Māori perspective are our ancestors. I think we could all have an enhanced experience of national parks if the Act was amended to recognise that. These interviews are supported by the Royal Society of New Zealand, which promotes, invests in and celebrates excellence in people and ideas, for the benefit of all New Zealanders. Read more about the new Fellows of the Royal Society of New Zealand. This is wonderful and illuminating commentary. Thank you Jacinta and Lynley for offering it. These facts and insights are hugely valuable to those of us who think and write about wildlands and their place in our lives. Great article and a fabulous move forward. But can someone please explain how this differs from Ecuador’s adoption of the Rights of Nature into its constitution in 2008? Is it that they are National Parks here instead of the whole of nature?